This category of points is handled as independent on map and is added to the app by Locus user. These points can be downloaded from database sources around the world (e.g. geocaches from Geocaching.com) or imported from your device. They can be created on the spot or photographed. They are managed in the Points manager, can be stored in folders, grouped, sorted, filtered and edited in many ways. These points are referred to across the application as just “points”. The other category of points are an integral part of LoMaps. 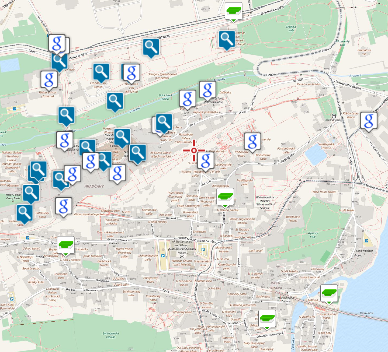 They are a direct output of OpenStreetMap database and carry a lot of information about almost all point objects on the map, beginning with hill peaks, church monuments and other landmarks and ending with civil facilities like post offices, ATMs, gas stations etc. These Points of Interest can not be created, deleted, renamed or otherwise manipulated but you can be guided or navigated to them, you can share them, copy them etc. It is possible to display these points above any other map - just tap Menu > More functions > Points of Interest(BETA) and choose any category. However, it is necessary to have LoMaps of the same area downloaded.